Celebrating the African contribution to Mexican culture, this book shows how religious brotherhoods in New Spain both preserved a distinctive African identity and helped facilitate Afro-Mexican integration into colonial society. Called confraternities, these groups provided social connections, charity, and status for Africans and their descendants for over two centuries. Often organized by African women and dedicated to popular European and African saints, the confraternities enjoyed prestige in the Baroque religious milieu of 17th-century New Spain. One group, founded by Africans called Zapes, preserved their ethnic identity for decades even after they were enslaved and brought to the Americas. Despite ongoing legal divisions and racial hierarchies, by the end of the colonial era many descendants from African slaves had achieved a degree of status that enabled them to move up the social ladder in Hispanic society. 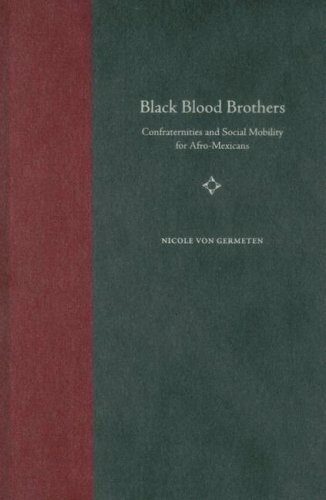 Von Germeten reveals details of the organization and practices of more than 60 Afro-Mexican brotherhoods and examines changes in the social, family, and religious lives of their members. She presents the stories of individual Africans and their descendants—including many African women and the famous Baroque artist Juan Correa—almost entirely from evidence they themselves generated. Moving the historical focus away from negative stereotypes that have persisted for almost 500 years, this study is the first in English to deal with Afro-Mexican religious organizations. Rappaport, Joanne, The Disappearing Mestizo: Configuring Difference in the Colonial New Kingdom of Granada (Durham: Duke University Press, 2014). Joanne Rappaport argues that even in the seventeenth-century classic satire known as El Carnero, set in what is now Colombia, the main character avoids identification as a mestiza, demonstrating the disappearing elusiveness of this term. The fact that readers cannot be sure if Inés de Hinojosa’s mother was or was not an indigenous woman brings directly to life the point Rappaport explores throughout her book. Subjects of the Spanish crown living in the sixteenth-, seventeenth-, and even eighteenth-century New Kingdom of Granada avoided categorization as mestizo when it suited them, although they sometimes took on the label if it seemed expedient at a particular moment. Rappaport effectively proves that identification as mestizo, mulatto, or even the more basic categories of Spanish, Indian, and black, does not equate to a stable, genetic, or genealogical “race” in the modern sense of the word. These categories are beyond fluid or malleable, the common explanation for why one individual might receive several different “racial” identifications during their lifespan. Rappoport supports these arguments with ethnographic explorations of several suggestive case studies, in a far more effective and readable style than would be provided by the tiresome citation of innumerable confusing examples, or even worse statistical analysis. At the end of the book, the reader actually remembers the individuals under discussion and feels a sense of knowing them as well as possible and understanding how their life experiences elucidate why mestizos represent a “disappearing” category. Rappaport’s analytical narratives include individuals sometimes classed as mestizos, but otherwise known as a duped doncella, a politically engaged cacique, an adulterous widow, a frustrated, blustering upwardly mobile Bogotá alderman, a man who just wants to stay with his family and friends in an indigenous village, and even the stereotypical abusive, rabble-rousing mulatto. Rappaport also takes a look at the physical descriptions contained in casa de la contratación travel documents, the early modern version of passport photos, expressed in standardized verbiage describing hair texture, skin tone, and most importantly, beards. In the sixteenth and seventeenth centuries, the most common color used to describe Spanish skin was brown [moreno].